The Semacon Model S-950 AC operated compact automatic currency authenticator features a simple Pass/Fail indicator and eject direction control. Feeding a bill is easy and is followed by an immediate indication of authenticity. The S-950 verifies banknote paper density and size, checks both sides for the valid magnetic features, metameric infrared marks, ink properties, and banknote infrared images. It provides the highest counterfeit detection accuracy available in a compact point-of-sale machine. 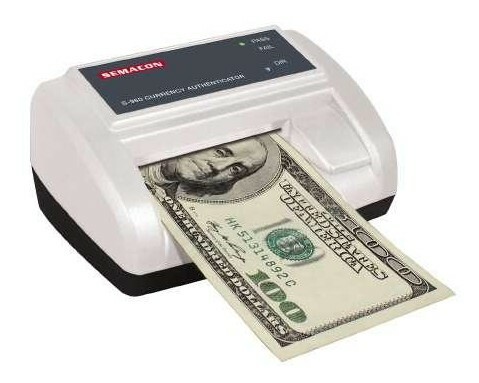 Banknotes can process at a rate of 80 per minute. Authenticated notes can be ejected through the rear causing the PASS indicator to illuminate. Suspect notes are returned to the feed tray causing the machine to beep and illuminate the FAIL indicator. The Model S-950 operates on AC power only. It is also upgradable for handling future banknote releases by the Federal Reserve. The Semacon Model S-950 AC operated compact automatic currency authenticator features a simple Pass/Fail indicator and eject direction control. Feeding a bill is easy and is followed by an immediate indication of authenticity. The S-950 operates on AC power only.